I guess we won’t know until after the big game whether this unlikely prediction comes true, but I’m sure there will be more than a few punters having a geeky and cheeky bet on the outcome of this years Super Bowl. 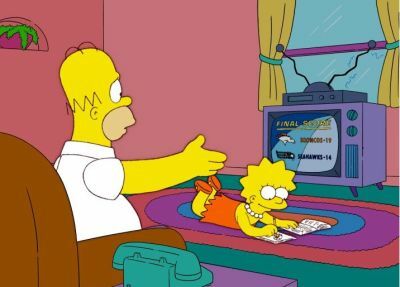 Fans of the show will quickly tell you that “The Simpsons” has been predicting world events and pop culture trends since it began in 1989 and there is even an infamous Buzzfeed list on this very subject. Will Seahawks’ Richard Sherman keep everyone entertained with some good old fashioned smack talk, will the viral Super Bowl adverts overshadow the game itself? I guess we will have to wait until Super Bowl Sunday for all the answers.